Understandably, you will experience a multitude of emotions when you hear about your loved one’s diagnosis. You may feel sadness denial, and even anger. “Caregiver’s Guilt” is one of the most common feelings that caregivers experience. As they watch their loved ones start to forget basic things, they may start to blame themselves for not doing more. What if you fed them healthier meals? What if you encouraged them to be more active? Unrecognized guilt can bring on unhealthy feelings like depression. Face your feelings head-on and don’t let them imprison you. In the early stages of Alzheimer’s, it’s important to start considering future legal plans. Legal procedures can ensure that the wishes of the person with Alzheimer’s are carried out. You may want to involve family and friends to research your options concerning wills, inheritance, and the estate. Consider finding an elder law attorney to go over relevant documents. Reviewing financial plans early is just as important because sometimes, it means a spouse or child has to take on a brand new role. If their loved one was always the one paying the bills or balancing the checkbook, then caregivers should use this time to learn how to take on these important tasks. While every case of early-stage dementia is different, it’s common for caregivers to have to remind their loved ones about issues such as appointments, people’s names, and managing money. You want the patient to have as much independence as possible, but don’t be afraid to assert yourself into the situation. Look at everything like a team; if your loved one wants to do the checkbook, offer to provide a final look over. It’s important to keep them active so they feel more confident about themselves. When you become a caregiver, you will have a lot of questions. Knowing what to expect for yourself and your loved one with dementia will help you immensely in the long run. There are countless resources available online and in person to allay the anxieties you may have. While articles and brochures deliver plenty of information about symptoms and skills, they don’t necessarily talk about unique situations. Caregiver support groups are safe places for people to learn about other caregivers’ experiences and talk about their own frustrations. 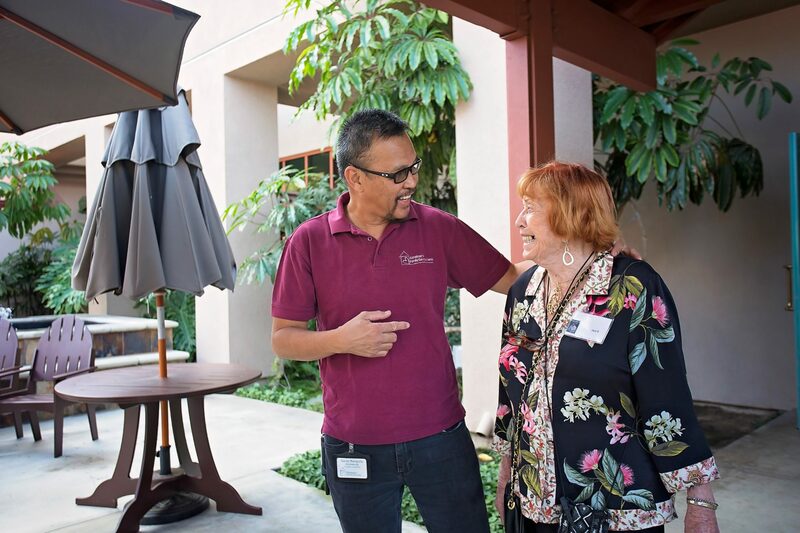 They provide a sense of belonging for caregivers who feel isolated. For more information on caregiver support groups at AFC, please call (714) 593-9630. Falls are common among seniors, but they are NOT a normal part of aging and CAN be prevented! Traci Roundy and the Alzheimer’s Family Center’s nursing team have listed 5 easy steps to prevent falls for your loved one.